In the early 2000s, China adopted a development model based on low-wage manufacturing, which led to a reputation that “Made in China” meant poor-quality goods. In recent years, Beijing has been making changes to bolster the competitiveness of its domestic companies and to catch up with high-tech development in the West. In May 2016, Chinese Premier Li Keqiang spoke of the need to upgrade the country’s manufacturing sector: “China is already a big manufacturing nation, but far from a manufacturing power. Integration of manufacturing and the internet is an inevitable path of modern industry,” according to the state-run China Daily. One key industry that Beijing has focused on is electric vehicles. In order to become a leader in the global electric car market, China’s strategy is to steal critical technology through investments in foreign companies. “Chinese enterprises and the government see the technology transfer from abroad as an important way to accelerate technological progress and to achieve the ambitious political goals,” according to a 2016 assessment of Beijing’s “Made in China 2025” economic blueprint by German think-tank, Mercator Institute of China Studies. Germany, in particular, has seen increased Chinese investment in recent years, as China has set its eyes on Germany’s advanced innovations in automation, robotics, and automobiles. And indeed, robotics and new energy vehicles were included in the list of 10 sectors China wishes to develop by 2025. Now, the competition from China seems to be edging close. A July 23 report issued by Germany’s central bank Deutsche Bundesbank predicted that Germany’s electric car makers would soon face a stiff challenge from China, according to German news agency Deutsche Presse-Agentur (DPA). The report also speculated that pressure from China would soon materialize, given that it will soon export in greater numbers its domestically-produced electric vehicles. In Chinese media, China’s automobile industry is often described by the phrase “overtaking somebody by changing lanes”—meaning that the country must take an expedited path if it wants to first catch up with other countries, and then surpass them to become the leader. According to a June 5 article on Chinese news portal Sohu, the development of China’s auto industry began around 1991. And after years of state planning, government subsidies, and development programs, China’s automakers are set to manufacture about 900,000 new-energy vehicles (NEVs) this year, including cars and buses powered by electricity, solar, and ethanol. The number would increase to 6.09 million by 2020, according to data by the Chongqing Vehicle and Test Research Institute. 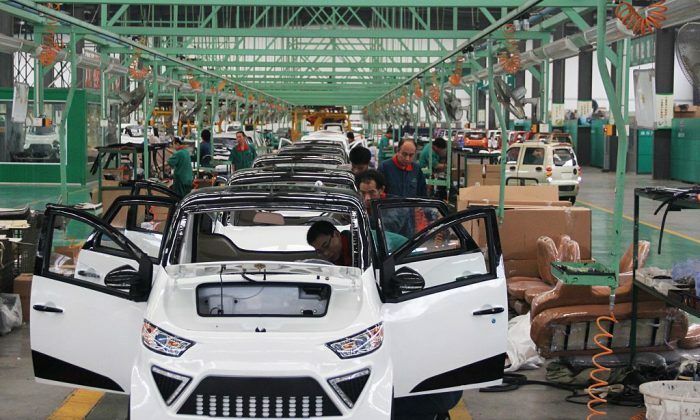 China manufactured just 8,159 NEVs in 2011, according to statistics by the trade association, China Association of Automobile Manufacturers (CAAM). As of the end of 2017, government subsidies into the NEV industry totaled 50 billion yuan (about $7.37 billion), according to Sohu. However, China still lags behind in many key technologies, such as manufacturing advanced semiconductor chips, which drive everything from personal computers to electric vehicles to ballistic missiles. Chinese investment in Germany has focused on automation firms and automakers. One of the most well-known cases involves Li Shufu, chairman of Zhejiang Geely Holding Group, an automaker based in Hangzhou City, Zhejiang Province, and his investment of $9 billion investment to acquire a 10-percent stake in Mercedes-Benz maker Daimler in February, according to Reuters. And since at least 2013, China has invested heavily in German firms like KHD Humboldt Wedag, an engineering company that supplies machinery parts. China’s state-owned aviation conglomerate, Aviation Industry Corporation of China, purchased a 79 percent stake, according to the Mercator Institute. In December 2016, China’s Midea Group, an electrical appliance maker headquartered in Beijiao, a town in southern China’s Guangdong Province, acquired Kuda, a German maker of high-tech robotics for factory automation, according to Reuters. “We certainly do have to be concerned with this if we have the impression that behind the potential buyer lies a foreign state with interests that go far beyond the acquisitions,” Maassen told reporters on July 24 in Berlin.